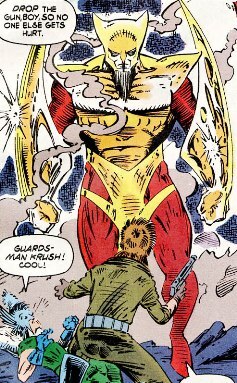 Powers/Abilities: Krush stood about 8 feet tall and could grow to twice that height with his skin then becoming amber-hued. He had tremendous strength that increased with his size and was heavily armored, including hardened gauntlets. 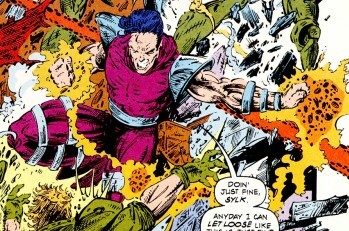 (The Inhumans: The Great Refuge) - Krush patrolled the Kree refugee settlements surrounding the city of Attilan on the moon and came across Kree children fighting with Inhuman children, but was too late to stop the Kree boy Dal from shooting the Inhuman child Avion and nearly hitting another, Aeric. 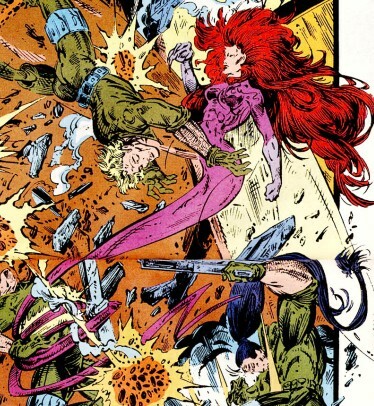 Krush carried the bloodied body of Avion to the chamber where the Inhuman Genetics Council, led by Thernon and Kitang, were considering the fate of newly arrived Kree would-be refugees (actually assassins). Later, several Kree armed and led by Major Fahr, stormed the laboratories holding the Terrigen Mists to steal it for themselves, but were confronted by the Kree Guardsmen Krush, Blaast, Payne, Rok, and Sylk. Three Kree managed to break their way in and rapidly mutated from the Mists, one blasting the Inhumans unconscious. The Inhuman royal family arrived and stopped the assassins. Krush was amongst those present at the trial of the Kree assassins and watched as all of the Kree refugees left Attilan in a judgment of banishment. He then farewelled the Inhuman royal family as they returned into exile. Comments: Created by Skip Dietz (writer), Robert Brown (pencils) and Rey Garcia (inks). 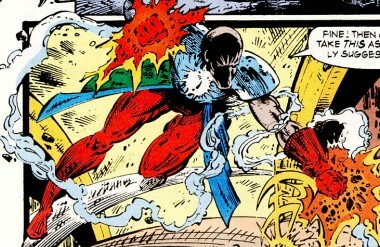 Karnak referred to Krush and his group (metaphorically) as second-stringers. The issue seems to be segmented into eight 8-page chapters and I suspect it may originally have been touted for Marvel Comics Presents or some such. There were 3 colorists involved in this issue and it shows. The one-shot "The Inhumans: The Great Refuge" can be considered as Inhumans II#1. An Inhuman Guardsman, Blaast could project fiery energy blasts and fought the Kree soldiers and assassins in defense of the Great Refuge, but failed in stopping them accessing the Terrigen Mists. Major Fahr and another Mist-mutated Kree knocked out the Guardsmen until Black Bolt and his royal family rescued them. It's unrevealed if he was fully masked or if this was part of his Inhuman mutation. Another Inhuman Guardsman, Payne could generate energy-charged fists that magnified his punches. He fell to the two Terrigen Mist-enhanced Kree soldiers. Rok was one of the first Inhuman Guardsmen to encounter the Kree assassins that had arrived under the leadership of General Maston-Dar. Rok informed Inhuman interim rulers Thernon and Kitang. Initially mocking and threatening him, Maston-Dar and his men knelt before Rok and announced themselves refugees. Later, Kree Major Fahr and another Terrigen Mist-mutated Kree knocked out the Guardsmen until Black Bolt and his royal family intervened. Afterward, Rok joined in the cordial farewell to Black Bolt when the royal family departed. Although exposed to Terrigen Mists like other Inhumans, he had no (discernible) powers but was very proficient at wielding guns with accuracy. 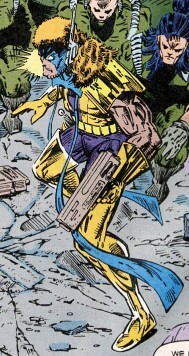 Sylk was an Inhuman Guardsman who had a long ribbon-like lower part of her body as part of her Inhuman mutation. She stood against the Kree soldiers but fell before the blast of the Kree mutate, Major Fahr. She later joined farewelling Medusa and the rest of the Inhuman royal family. Her tendril and long flowing red hair hint at a possible connection with Medusa.